The Parent Coalition for Student Privacy and the Network for Public Education just released a report card that grades all fifty states and the District of Columbia on how well they protect the privacy of students’ confidential information. Since 2013, many laws surrounding student privacy have been passed, but there is more work to be done. This report focuses on the 99 laws passed in 39 states plus the District of Columbia between 2013 and 2018. Every state received points in each of the following seven categories: Transparency, Parental and Student Rights; Limitations on Commercial Use of Data; Data Security Requirements; Oversight, Enforcement, and Penalties for Violations; Parties Covered and Regulated and Other, a catch-all for provisions that did not fit into any of the other categories. Read here to see how your state did. Then use the findings as a blueprint for advocacy in your state! 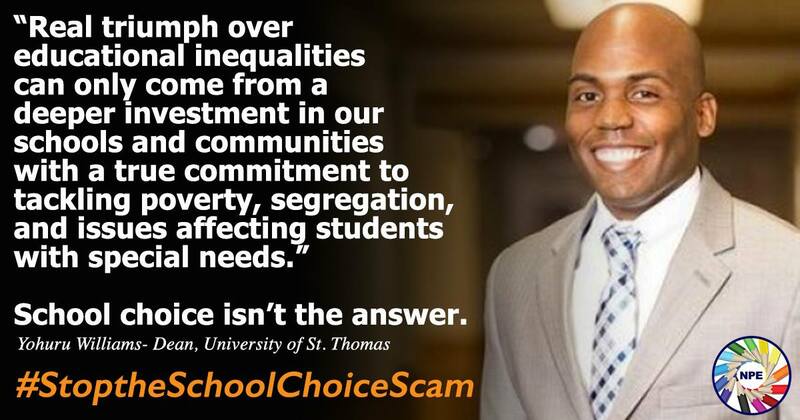 Don’t forget it is School Choice Week--please be sure to let your Congressional representatives know that your first choice is well-resourced, public schools for America’s children. Send your email today by clicking here. Congratulations to the teachers of Los Angeles and their supporters. UTLA held fast and as a result class sizes will be smaller, there will be more counselors and nurses in schools, and students will have access to more of the support services that they need. You can read more about the settlement here on Diane’s blog.